Good value but is there anything new? Now after having played Crysis, next on my review list was F.E.A.R. Perseus Mandate and within a few minutes of starting play, I knew I’d have to leave it for a while and come back to it once the warm fuzzy glow of Crysis’ abundantly detailed levels had worn off. Simply put, and through no fault of its own, F.E.A.R. Perseus Mandate looks and feels bland and sparse compared to the hugely detailed environments brought to us by Crytek’s shooter. I say through no fault of its own because you can hardly blame a game for not having the power under the bonnet to fill a level with hundreds of objects. But that’s the thing, F.E.A.R. Perseus Mandate is running on an engine that’s got to be what, two years old? And as we know, the FPS world moves faster than a Canadian sprinter on a party sized bag of steroids and the F.E.A.R. engine should’ve been retired a while ago… probably after Extraction Point. That’s not to say that F.E.A.R. Perseus Mandate isn’t a lot of fun in places, it’s just that the engine looks tired, even compared to Half Life 2: Episode 2 (which is itself looking a bit dated). 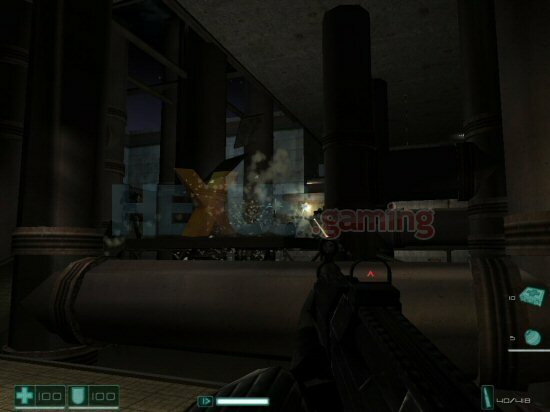 The problem is that Crysis, even under XP and DX9, has now set a new benchmark which, frankly, F.E.A.R. Perseus Mandate has no chance of competing with. 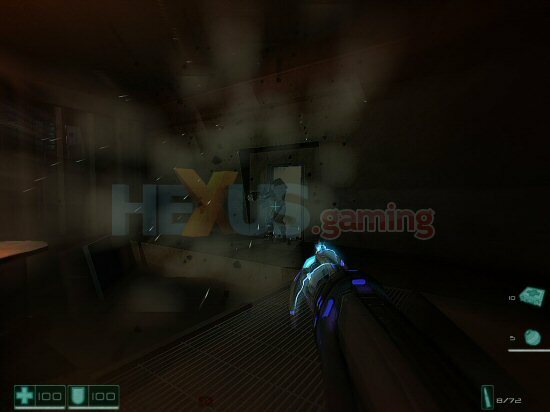 So although, graphically, F.E.A.R. 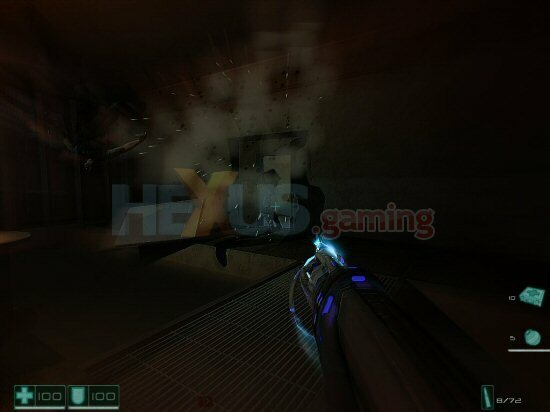 Perseus Mandate is no better or worse than the original F.E.A.R., it’s essentially out of date on release when compared with other current releases. But let’s put looks aside and focus on the gameplay and story, which for me was always one of F.E.A.R.’s strong points. Now at this point I need to make it clear that F.E.A.R. Perseus Mandate is not quite what you would call a full game but then it’s also a fair bit larger than the average expansion pack…. And you don’t need the original F.E.A.R. to play. You get 7 missions with 3 bonus missions once you complete the main game. Holding F.E.A.R. 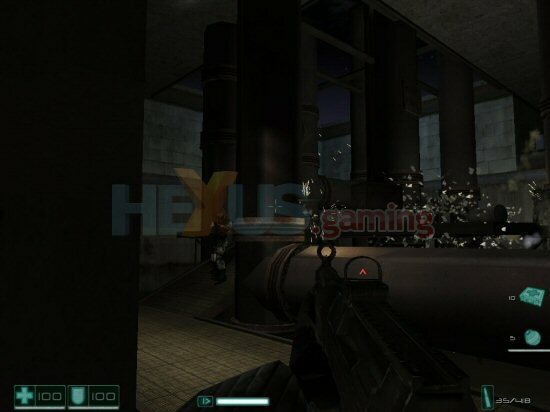 Perseus Mandate up next to Medal of Honor: Airborne, you can easily see that F.E.A.R. Perseus Mandate offers up decent value for money… but that’s only because Medal of Honor was so criminally short. That said, with an RRP of £29.99, you’d be forgiven for expecting more from F.E.A.R. Perseus Mandate but happily you can pick it up for half that price from Play and Amazon, which makes it better value. So it pays to shop around. As I mentioned earlier, the storyline in F.E.A.R. Perseus Mandate runs alongside the original F.E.A.R., giving you a look at what else was going on whilst Alma and Fettle played with your mind in the original game. Of course, you need to look past the fact that there’s no mention of another F.E.A.R. team in the original, but it’s a minor point and worth allowing some artistic license, ok? As to the actual storyline in F.E.A.R. Perseus Mandate, well, to be honest, it’s thinner than a BNP leaflet on racial tolerance and in places makes about as much sense as Jade Goody explaining quantum physics. To summarise, you’re a new F.E.A.R. 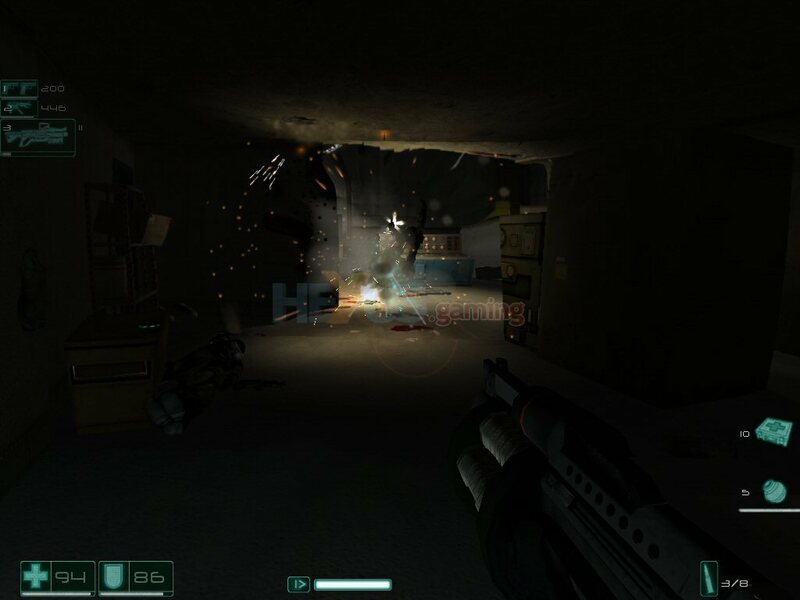 recruit sent into another part of the complex to back up the original F.E.A.R. team and deal with some errant forces seemingly under the control of Paxton Fettel. But you now have to deal with a bunch of mercenaries who are after something else and you have to find out what that is. Things start off promisingly with you going in backed up by two squad members and the now obligatory ‘training’ level is nicely masked as the entry into the main complex. But just as you start thinking that F.E.A.R. Perseus Mandate might offer up something new, perhaps a bit of squad based action, you find yourself isolated and alone. Your previously invulnerable squad-mates are killed off and you’re left to make progress in what becomes a fairly standard solo FPS.